Game Information: If you happen to be a fan of classic Chinese legends and history, or if you just like the imagery and action found in classic Chinese martial arts cinema, then 108 Heroes may just by the perfect pokie for you. 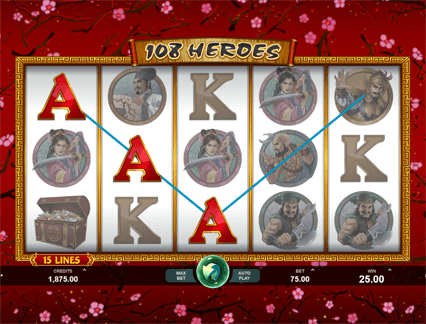 Conceived and designed by Microgaming, who are known for coming up with interesting and innovative pokies, 108 Heroes is sure to thrill and reward with its simple 5 reels and 15 paylines structure. The beauty of Microgaming pokies is that they are usually very easy to get into and start playing right away. There is no steep learning curve to concern yourself with in 108 Heroes and, after just a few minutes of familiarising yourself with the main characters, symbols and gameplay, you can start putting together winning combinations with ease. With a nice and relaxed coin range to suit virtually any playing budget, 108 Heroes is classified as a low variance pokie. This means that you can enjoy wins fairly often, albeit somewhat smaller in size than other pokies with a higher variance. This is not necessarily a bad thing, as frequent wins can be a lot of fun and can help to keep you motivated to play on for hours. 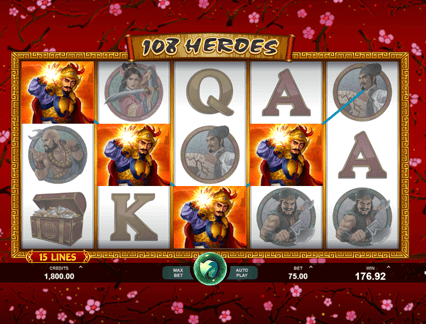 108 Heroes offers a simple layout, with just 15 paylines over a 5 x 3 grid format. This makes the game a great option for novice pokies players looking for a fun and action-packed pokie to get into. Players can fine tune just how many coins they want to bet per payline and can also decide how many paylines are in play per spin. This makes 108 Heroes ideal for all sorts of budget demands and its low variance should keep you playing for even longer. There are plenty of interesting icons to enjoy, many of which offer special payouts and functions during the base game as well as bonus rounds. The Wild Symbol: The wild symbol in 108 Heroes is the actual game logo and it can be used to substitute for virtually any other game symbol, helping to create fast and quick winning combos on just about every spin. The only symbol it doesn’t substitute for is the games scatter symbol. In addition, the wild symbol can pay out a princely sum of 37,500 coins if you manage to land five of them in a row. You’ll also be rewarded with 10, 000 coins for getting four in a row, 1,000 coins for getting three in a row, and 24 coins for two in a row. Scatter Symbol: The scatter symbol in 108 Heroes is the Chinese letter symbol and is responsible for rewarding you with all-important free spins during the base game. The number of free spins that you can unlock by getting three or more Chinese symbols to land across the five reels is always set at ten. However, the good news here is that you can re-trigger the free spins bonus round over and over, giving you ample opportunity to really put together some big paydays. Another plus is that your free spins also come with a multiplier of up to three times your winning amount. Scatter symbols themselves are worth coins, and getting five in a row will pay out 30,000 coins, while getting four will pay you 3,750 coins, three will pay your 300 coins, and two will yield 150 coins. Bonus Feature: Another important symbol to look out for in 108 Heroes is the Treasure Chest symbol. If you manage to land three, four or five of the treasure chest symbols anywhere across the five reels, you get to pick three, four or five treasure chests out a possible twelve in the bonus game. The more bonus symbols you get, the bigger the potential treasure hidden in the treasure chests will be. Other Symbols: There are ten symbols in total to be found in 108 Heroes which includes standard playing card symbols including king, queen, and ace, along with a range of Chinese martial arts heroes. The golden warrior pays out 2,500 coins for a five in a row showing as does the blue warrior. The warrior with no shirt pays out 1,250 for five in a row, while the geisha lady pays out 625 for five in a row. The really muscular warrior pays out 500 coins for five in a row. While the game isn’t Microgaming’s best in terms of graphics, it still looks really authentic and colourful and is perfect for martial arts or Ancient Chinese history fans. The symbols and decorations used in the game add a great deal of authenticity to the screen and the game is fun to play. While 108 Heroes does not feature any kind of progressive jackpot option, which Microgaming are famous for, the game does pay out a nice fixed jackpot of 120,000 coins. Look out or the King’s Treasure bonus round which gives you the opportunity to win secret treasure chests filled with coins. Get as many treasure chest symbols as you can to give yourself the best shot at big treasure amounts.